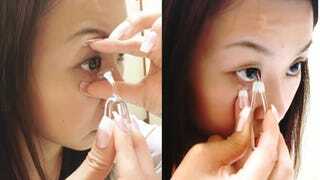 These Are Japanese "Contact Lens Tweezers"
Wear contacts? Don't want to stick your fingers in your eyes? A Japanese company has created a contraption called "Meruru." In short, you are looking at contact lens tweezers. You don't have to use your fingers to remove your lens, but you can use this silicone set, which seems slightly scary. The company claims it spent three years of trial and error to develop Meruru forceps and little shovel to scoop out your lenses, creating numerous prototypes and test versions. The final product costs around $20, and the company claims this is the world's first product of this sort.